Werther utilizes high quality desiccant material to absorb water vapor from compressed air, and these regenerative desiccant air dryers are designed for operations that require an extremely low dew point. This is necessary in extremely cold environments where moisture in the air would freeze inside the compressed air system piping and result in blocked flow. The twin-tower design of our dryers allows simultaneous air drying and desiccant regeneration to occur without interruption of compressed air flow. These systems contain a large opportunity for energy savings and cost benefits because of their overall efficiency. Regenerative desiccant air dryers use a porous desiccant that absorbs the moisture by collecting it in its pores, allowing large quantities of water to be retained by a small quantity of desiccant. Self regenerative desiccant air dryers with built in 5 micron pre filter and 0.01 micron coalescing filter, are capable of flow rates from 2.9 CFM - 588 CFM and an option for -4°F(20°C), -40°F(-40°C), and -94°F(-70°C) outlet dew points. 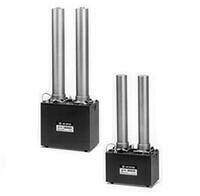 The easily replaceable desiccant cartridges make this dryer simple to operate and maintain.